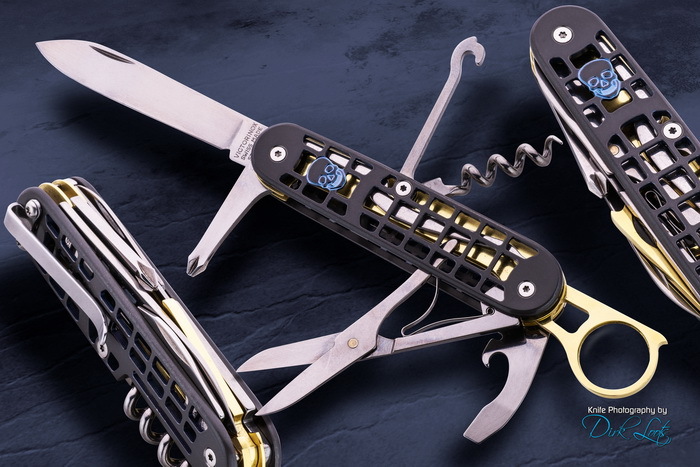 **** Chosen by Winner: Peter C.
Canadian Robert Lessard has developed quite a reputation for his customized and modified Swiss Army Knives. This donation knife is based on is a retired 91mm model known as the Yeoman. He has crafted skeletonized 6AL-4V Titanium scales with a matte tumbled finish and an engraved and blue anodized skull. The standard plastic magnifying glass housing has been replaced with a machined cartridge brass one. This custom SAK is finished with matching polished brass liners, brass nubbed tweezers slotted on back scale and a deep carry pocket clip.